If you find yourself in the position of not wanting to use a memory foam pillow and want to try something more natural, an option that you should definitely try is the bamboo pillow. There are many reasons for you to buy a bamboo pillow and the fact they are eco-friendly and so much healthier is the most important one. Bamboo is made from an organic source and it’s highly breathable. A bamboo pillow keeps you cooler and is still supportive. 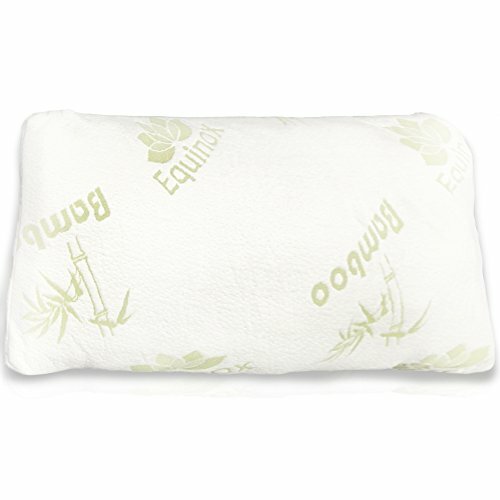 As the process of harvesting bamboo doesn’t involve any toxins, a bamboo pillow is also non-toxic. Natural ingredients come with so many useful qualities and bamboo makes no exception. Bamboo pillows are naturally resistant to bacteria and to dust mites. They are hypoallergenic and make the no.1 choice for anyone struggling with allergies, snoring and other breathing issues related to sleep. 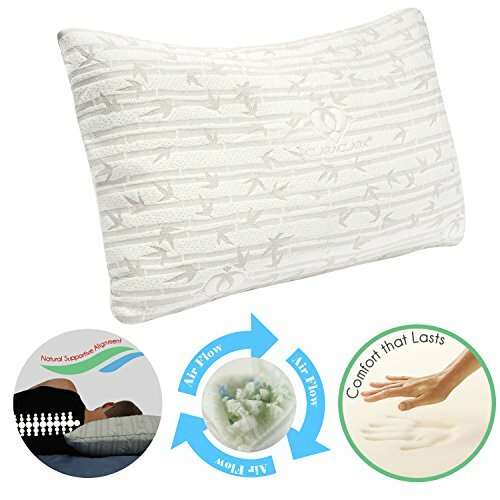 What’s also great about the bamboo pillows is not only the breathability, but also the constant comfortable body temperature they manage to give. 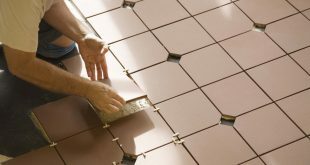 They are efficient for absorbing moisture, which is always a good thing. The bamboo pillows are so various when it comes to size and shape and it’s impossible not to find the right one for you. Additionally, bamboo pillows differ when it comes to softness/firmness. You don’t need to stress out if you think your sleep position can’t handle a bamboo pillow. Due to their design and variety, bamboo pillows are highly versatile and you may find the perfect one, no matter how you typically sleep. 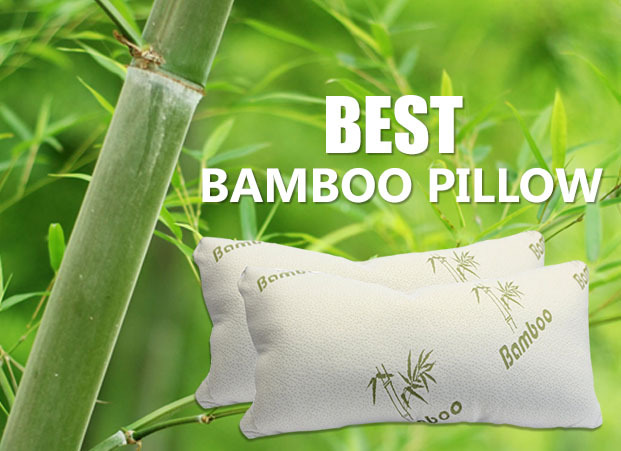 Keep in mind that, in order to have the best results, you do need to take care of your bamboo pillow. It may need a couple of days to fully expand to its original shape and it’s better to air it out a bit before the first use. Don’t expect the bamboo pillow to give the best comfort from the first night and allow it a few days until it gets the most comfortable shape for you. Some bamboo pillows come with removable covers that are easy to clean. You may also hand wash the pillow and let it dry. Last but not least, you may customize your bamboo pillow and fill it as much as you want, until you get the right thickness for you. What’s not to like about that? Even though it’s low priced, you may get a full surprise when getting a pillow like the Equinox International Queen/Standard Size 17 X 25-Inches Shredded Memory Foam Pillow with Removable Bamboo Soft Pillow Case. The pillow is well made and its seams and materials are pretty good quality. It’s also made with good quality shredded memory foam. The foam is CertiPur-US certified, so it contains no harmful chemicals. 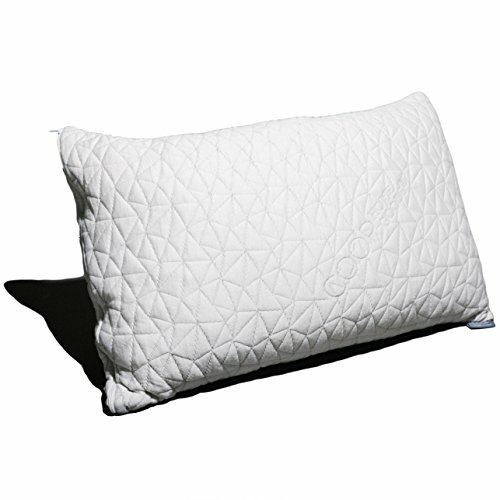 The pillow has a hypoallergenic texture and offers protection against dust-mites and mildew. We like the pillow as it creates cradling comfort and has a good balance between softness and firmness. It adjusts to your head and body and gives you just the right of fluff that you need. The pillow is firm and highly customizable. It stays cool and its price is unbeatable, especially considering the quality you get. The pillow is quite long lasting and keeps its original shape for a good amount of time. As for the cleaning, you don’t have to worry much. The cover is easy to remove for machine washing, whereas the pillow itself may only spot, cleaned with some mild soap and water. It comes with a standard pillowcase, vacuum-sealed in a nice looking carrying bag. You may easily use it as a gift for someone you love. All in all, for a low price, you get a pretty reliable, comfortable and hypoallergenic bamboo pillow. Versatile and cozy for the whole night sleep, the Clara Clark Rayon made from Shredded Memory Foam Pillow is an imported option that gives you nice support for quite some time. The pillow is made with 40% bamboo and 60% microfiber and is filled with 100% shredded memory foam. The pillow adjusts nicely to your head and body, creating a nice, cooling and breathable support for your sleep. It offers a natural alignment and may help you with the snoring, back/neck pain or migrants. We also like the pillow for its versatility as it brings comfort to any sleep position. It helps your muscles relax and aligns your spine properly. The airflow on the pillow is very efficient due to the shredded memory foam from the filling. The pillow is breathable and keeps you cool, keeping dust mite and bacteria at distance. The pillow is easy to tare care, as its cover is zippered, removable, and machine washable. Hypoallergenic, antibacterial, and dust mite resistant, the pillow is a nice choice that eases neck strain, shoulder pain and it minimizes pressure points just as well. The minor issues don’t hold us back though and we still see the pillow as a comfortable, cool, efficient option for so many of us. 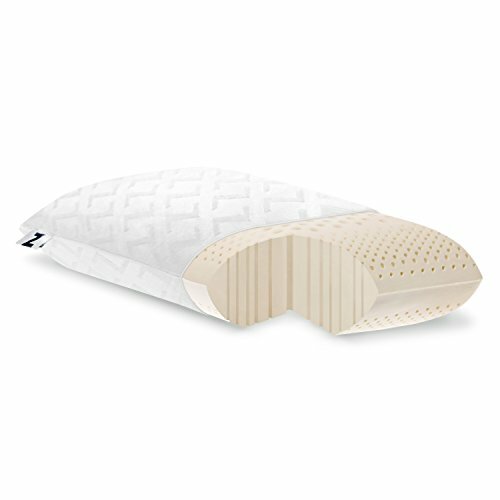 If you are a stomach sleeper, a nice option and dependable pillow for you is the Xtreme Comforts Slim Hypoallergenic Shredded Memory Foam Standard Bamboo Pillow with Cover. The pillow is made here at home in our USA and uses CertiPur-US certified foam that contains no harmful chemicals and is safe to use for the environment also. 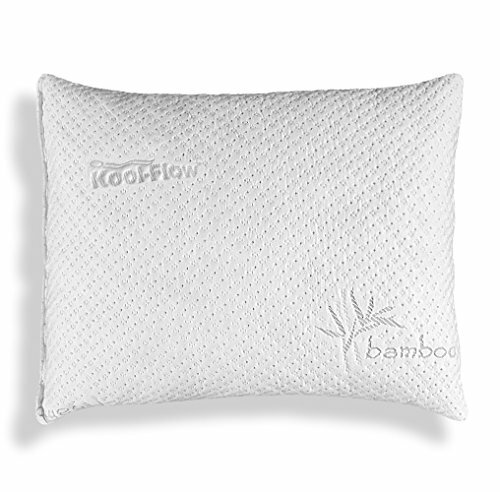 The breathable Micro-Vented Kool-Flow Technology on the pillow combines so efficiently with the 43% Bamboo, giving you a pillow with good ventilation that keeps you cool throughout the entire night. The pillow is filled with shredded memory foam that doesn’t flat fast. The light scent of the pillow goes away in a couple of hours and the pillow is a great choice for the allergic customer just as well. When it comes to the comfort, we notice how the pillow works on various sleep problems: migraines, insomnia, snoring, neck/back pains. It gives the right alignment to your body and works also for the side and back sleepers. It minimizes tossing and turning in your sleep, alleviating typical pains from your sleep position. Its plush feeling and soft cover increase the comfort, without lowering the support. The pillow is machine washable and takes the intense use. It comes vacuum-sealed. No matter the minor flaws, for the comfort and support it gives, the pillow is a great choice especially for the stomach sleepers. 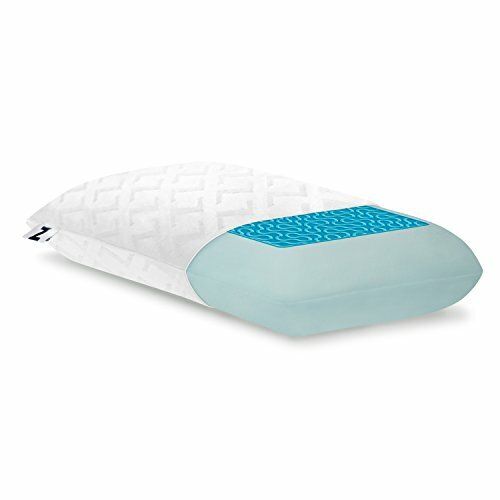 For those of you struggling with acid reflux, snoring and other various problems, a good solution for your help may be the Brentwood Home Zuma Therapeutic Foam Bed Wedge Pillow. The pillow creates a great support to elevate your legs or upper body to ease various pains. 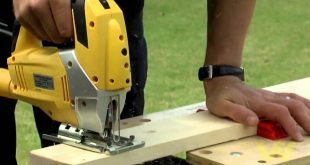 You may also use it as a trunk stabilizer when you lay on your side. It’s especially designed for anyone facing various problems: difficult breathing, acid reflux, poor circulation, back/neck problems, and hiatal hernias. The pillow becomes a comfortable, gradual ramp and uses gravity to keep the airways open and the reflux down. It alleviates neck and shoulder pains and minimized breathing problems. 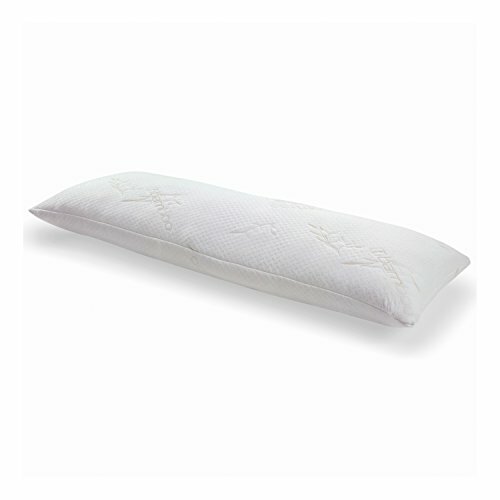 Its CertiPur-US certified foam ensures you that the pillow is made with no dangerous chemicals or flame-retardants. In case you are facing some allergies problems, it’s good the know the pillow is also hypoallergenic and dust mite resistant. The very soft stretch knit cover is easy to remove and may be machine washed. The soft material of the cover completes the firm, yet comfortable pillow. We’d rather focus on the good parts so we see the pillow as a great help for anyone with acid reflux, breathing problems or other various problems. Comfortable and proudly made here at home in our USA, the Coop Home Goods – PREMIUM Adjustable Loft is a bamboo pillow that you should try at least once. We like the pillow, as it’s fully adjustable so you may find just the right thickness for your needs. The pillow is made with shredded visco elastic memory foam and you may simply add or remove foam, according to your needs. It’s a versatile pillow that goes great for any sleep position. The pillow is efficient as it aligns properly the spine and ensures neck support. As it’s made with 40% Bamboo Derived Viscose Rayon and 60% Polyester, the pillow keeps you cool in the hot summer and warm in a cold winter night. It’s comfortable and it only needs a couple of hours to lose the specific smell. The pillow has CertiPur-US certify so it doesn’t contain any harmful chemicals. 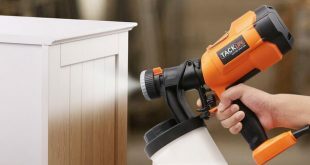 It’s hypoallergenic and dust mite resistant, being a safe choice for any allergic customer. Since it’s machine washable, the pillow is very easy to take care also. The risk for flattening is minimal and the pillow keeps its shape for quite some time. The minor cons aren’t deal breakers for us and we do keep it in mind when shopping. The more you are willing to pay for your bamboo pillow, the more you need to expect when it comes to its comfort and quality. 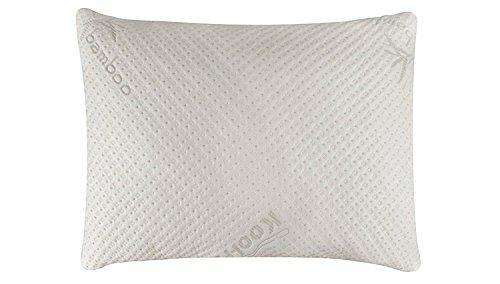 The Snuggle-Pedic Ultra-Luxury Bamboo Shredded Memory Foam Pillow Combination With Kool-Flow Micro-Vented Covering – Queen manages to bring multiple things on the table, not only comfort and durability. The pillow is proudly made here at home in the USA and uses Eco-Friendly Biogreen&CertiPur-US certified foam. It’s made with 43% viscose of bamboo, 56.4% polyester and .6% Lycra and the combination gives a soft, comfortable support for your sleep. The bamboo pillow adjusts orthopedically to your neck and body and gives a nice support, no matter your sleep position. It works also for the pregnant women, which is always nice. The shredded style combination memory foam is functional and doesn’t go flat shortly. The Kool-Flow feature on the pillow means it’s highly breathable and the micro-vented cover simply increases to cooling abilities of the pillow. Keeping you cool the entire night is one of the strong features of the pillow, as a matter of fact. The pillow is rather fluffy, but your face doesn’t sink into it. The pillow is hypoallergenic, dust mite resistant, and doesn’t contain harmful chemicals. It doesn’t have a specific smell either and it’s non-toxic. It’s very easy to take care of the pillow, as it’s fully machine washable. It’s very well made and has a luxurious appearance and a soft to touch feel. The minor downsides don’t diminish the overall value of the pillow that it’s versatile, breathable, comfortable, and dependable for many of us. When struggling with some hip pains or enjoying your pregnancy, a good body pillow that may bring an amazing change to your sleep it’s the Shredded Memory Foam Body Pillow with Viscose from Bamboo Cover by REST. The cover is not only soft to touch, but it’s also breathable, keeping you cool and fresh until the morning. The outer fabric has three layers woven together which increases the breathability and the durability of the pillow. 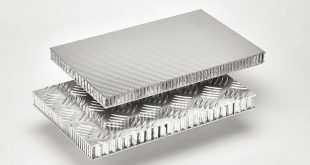 The cover absorbs moisture and gives a nice, constant temperature throughout the whole night. As the interior of the pillow is made from blended memory-foam, it’s safe and easy to machine wash the pillow. The pillow is also dryer-safe as long as you use the low heat. The pillow minimizes pressure points and eases all sorts of pain from sleep position. It doesn’t get flat and stays in place the whole night. Due to its ability to bring you comfort especially if you’re expecting, the body pillow remains a good option for many. No matter what many may say, we believe comfort it’s a matter of taste and same pillow may feel like the perfect choice for some and the worst option ever, for others. The Z 100% Natural Talalay Latex Zoned Pillow is made with 100% pure natural talalay latex and doesn’t contain any synthetic ingredients. The pillow offers a firm support, rather dense and it’s the best choice for a back or side sleeper. The foam formula and the zoned technology ensures zoned support, minimizing pressure points. 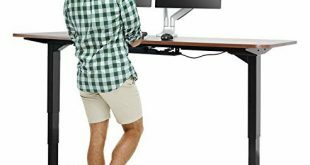 It gives amazing neck support and it’s quite bouncy. As a matter of fact, the pillow keeps its original shape for a long time and bounces back over and over again. Due to its consistency, the pillow is naturally mildew proof and dust mite resistant, keeping your allergies under control. It’s breathable and gives you a nice comfortable sleeping temperature. The pillow is completed by the soft, velour cover made with rayon from bamboo blend. The cover is removable for easier cleaning and has such a nice, soft touch feel. We also like the diversity of sizes, firm and plus densities and high/low profiles of the pillow. This versatility sure helps you find the best option for your needs. The pillow doesn’t get lumpy in time and conforms so nicely to your weight. All things considered, we still like the pillow for the comfort and support. The Z Gel Infused Dough Memory Foam + Liquid Gel Pillow with Removable Velour Cover – 5-Year Warranty – Standard stands out from many pillows with its one-of-a-kind combination of gel-infused foam and the two liquid gel packets. This combination is able to regulate temperature and to create a nice, constant temperature for your sleep. The liquid z-gel traps and distributes heat evenly, keeping you cool and fresh throughout the entire night. The dough memory foam formula also creates a soft, yet firm support that increases comfort and helps you sleep better. The dough memory foam is molded so it adjusts better to your body weight and pressure, easing any sleeping pains. The dual gel build and the reversible design keeps you cool the whole night. The support is soft and the pillow comforts the curves of your head, neck, and spine. The open cell build on the pillow is long lasting and quite resilient. This means the pillow doesn’t lose its original shape in time and keeps coming back to its original shape. The Bamboo Velour cover is incredibly soft and presents efficient breathability. The rayon from bamboo is highly breathable so the cooling effects of the z-gel really get to you. It’s easy to remove the cover for cleaning just as well. As it’s highly breathable, comfortable and cooling, the pillow is a great support for anyone. 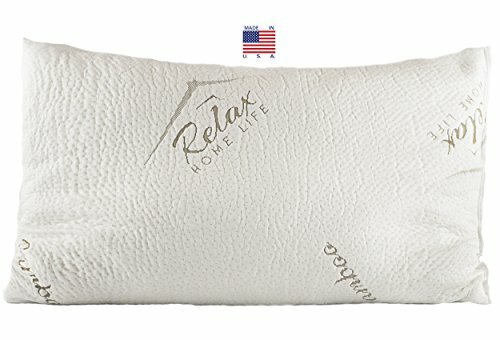 You may feel like it costs an arm and a leg, but the Relax Home Life Memory Foam Hypoallergenic Pillow with Stay Cool Bamboo Cover is sure worth to pay for it. The pillow is made here at home in our USA and comes with a 5-year warranty, which says a lot about its lifespan and manufacturing. We like the pillow as it conforms right the way to your head and neck, giving you a good support. It’s a comfortable pillow that helps with various pains related to sleep: snoring, TMJ, neck pains, insomnia or migraines. The pillow is made with good quality shredded memory foam that presents efficient ventilation. This translates into better breathability and cooler night sleep for you. The soft bamboo cover sustains the ventilation and cools you even more. The small pieces of memory foam inside the pillow lets you thin out of fluff up the pillow until you get the right height and perfect support for your body. This helps also with the versatility and the pillow is a good choice, no matter your sleep position. You may not feel it very flexible, but you can actually use the pillow for any position, without losing the comfort. As it’s made with hypoallergenic polyester and bamboo blend, the pillow is a safe choice for anyone fighting some allergies. The cover is very well made and has a soft touch feel. The pillow has only a slight smell in the beginning that goes away rather fast. It’s machine washable, but it’s better to use only cold water. In order to get the best results, you should put it in the dryer for 20 minutes on low so that you activate the foam. The minor issues don’t make us change our mind about the pillow, which we see it as a reliable, hypoallergenic and comfortable option, no matter how you sleep.